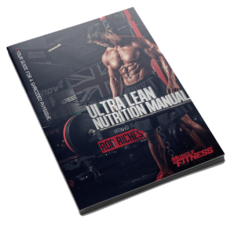 This package covers a 2-month (60 day) custom training program and nutritional plan that is built up specifically around your needs and target goals. So you’ve made some good gains in the gym and have seen some solid results over the past few months. Whether your gains have begun to slow down or may have stalled, or you’re thinking about taking your game to the next game and pursuing fitness modeling or competing, something needs to change. To get your body to this level of conditioning, you’ll need a watchful eye look over your physique and point out weak points to focus on with a specific training routine, and proper guidance with your nutrition planning. You’ll be working one-on-one with Rob Riches. Rob will be personally be putting together your weekly workout schedule and daily meal plan based on a number of factors including your weight, build, training routine and fitness goals. See below as to how this entire process works and can work for you. Step 4: After 4 weeks of following your custom training and meal plan, send it back to Rob along with updates on your progress and Rob will adjust several factors including changes to your workouts, sets & rep range, calorie intake and macro ratios.